One of my most-read posts each year, and why? Does misery love company? But this year, I headed that off at the pass by not buying very much for myself. The wedding meant the full kit for both sons, which put a happy dent in my budget. Despite that mitigating factor, some purchases returned better value than others. 1. Boots for moving through three seasons. 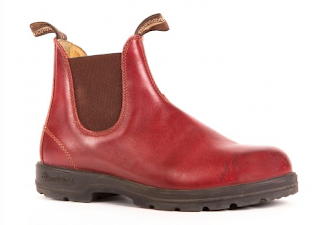 When I met reader Teresa for coffee last fall, she was wearing the same burgundy Blundstones, so we purred about how these sturdy, admittedly androgynous boots serve Canadian weather and walking women. Cost was about $CDN 220. Where I live, they are worn with pants, skirts and casual dresses. 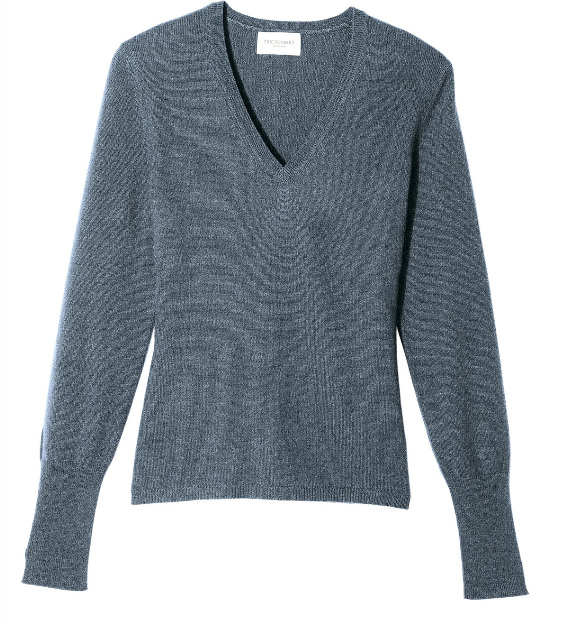 This style from Eric Bompard (shown in steel blue; my violet fluo colour was from last spring's palette), is one of their 30% silk/70% cashmere blends, which I find cozy and nicely washable. (Though Deja Pseu found hers pilled, mine have not.) Cost was around $180 but that's with the detaxe. What no photo shows is the wrist, which is slit about two inches on the outside seam, for that extra little quelque chose. I wrote about this vintage necklace before, but, for under $100, it has returned so much pleasure. Found by chance in a consignment shop. 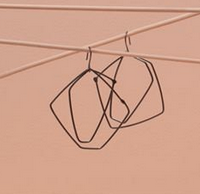 And from Montréal jeweler Gabrielle Desmarais, a pair of sterling double hoops. Girlfriend Susan bought the same pair, as might any number of women who asked me where I got them; price about $CDN 95. But my favourite jewelry purchase was not for me; I helped Etienne and Tash to choose her wedding ring, a delicate Art Deco platinum and diamond baguette band. Once again, the vintage market delivered a piece of beautiful quality and design at lower price than the new retail offerings. In early December, on a sale/free ship deal, I bought a J. Crew lambswool Fair Isle sweater, a well-composed pattern with translucent sequins (on the body from shoulder to high chest) that look like a dusting of sunlit snow. 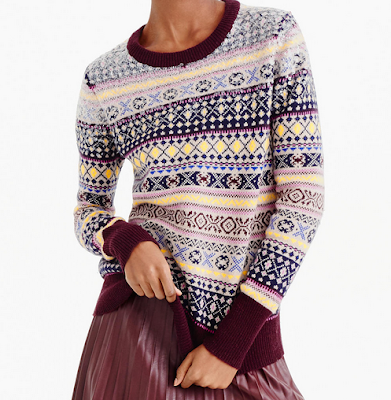 But it is not Brora's cashmere Fair Isle which, thank god, wasn't offered in the right colourway for me. However, unlike that Brora, I will not be wearing the J. Crew a decade from now, I can tell. I'm the kind who will hunt down extra matching sequins (the sweater came with four spares) but not one who will hand-sew every single one firmly to the knit. 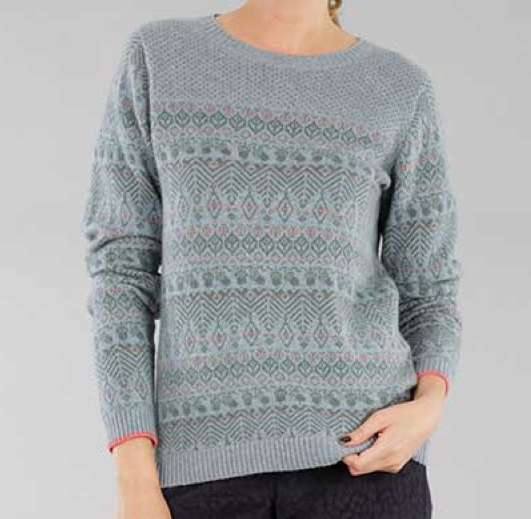 The Brora version is £219, presently on sale. With shipping and duties, that's over four times the J. Crew. The sole (pun intended) dog of 2015 were dressy sandals I had made to wear to the wedding; I have written about them here. Lesson: A cushioned sole is essential. Worn for two hours. At large holiday craft show, I admired a handsome bus-pass holder, but the price for this 3x4-inch piece would have topped $CDN90 with tax. Although I often pay a premium to support local artisans, I refused to fork over "show tax", the inevitable markup caused by hefty fees for show space and services. The craftspersons themselves have complained about these very steep costs; some no longer participate for that reason. I found that on Etsy, for about $30 including shipping, I could find a handsome handmade case and still Buy Canadian from Ashlin Leather. In the heady show atmosphere, surrounded by appealing goods and avid consumers, it's easy to lose your ability to judge value. Just knowing that I will eventually write this post keeps me away from impulse buys; I also ask myself, "When I am wearing this, what's not being worn (that is already in my closet)?" Maybe it was down to the dollar-diversion of that wedding—but what a sweet reason to award myself an A-. The minus, slender as those sandals straps, is just fine. I'm declaring victory. Do you track your spending? Beginning with the 2008 recession, I began to write every single purchase in a notebook. In the last three years, I've dropped recording small things like coffee or bus tickets, but I'm still vitally interested in whether the wardrobe items I buy return value. Yes I track my spending on my trusty Excel spreadsheets, so useful to know whats really going out if my wallet and bank account. Lately I did a rough mental review of my closet and confirmed what I suspected - I only need to buy linen pants, anything else is not necessary after the buying I've done over the past three years to build a new wardrobe. That's not to say I won't buy - two pairs of Bompard gloves are winging their way to me right now - I know I'll get a lot of use out of them having worn my other pairs a great deal this year. My new clothes and bits and bobs are working out well, I feel better dressed and more myself when I walk out the door. There have been a few expensive duds along the way - in particular a lovely green Brora cardigan that looks terrible on me, totally the wrong shape and fit. I've had much better luck with fit from Bompard, I can't seem to get the hang of Brora's styles so won't be buying from them anymore. Things that worked well - like you I found an inexpensive necklace, balsa perhaps, that I've worn a lot and just love. My La Canadienne boots have seen a lot of wear, they're super. My beautiful scarves from Jan Becker make me very happy. And finally found a pair of jeans that are perfect, unfortunately discontinued so I'll be taking very good care of them. You've been an enormous help with so much of this, thank you. It's similar to My Fitness Pal, isn't it? Accountability...My drawers and closets are still weighed down although I keep weeding. My goal is few purchases and more available funds for travel. Thank you for the reminder. I've been tracking my spending for three years, but what made a difference to me THIS year was also doing a complete clothing inventory. Once I knew how much I actually had, it became clear that I didn't need anything new for quite a while. Other than underwear and black t-shirts, that is. Going forward I will still track my shopping, but I am confident I will spend at least two-thirds less than I did last year. How many navy skirts does one person need, anyway? The answer is three, FYI; lace, sweater knit, and wool. Now that I have the inventory, I'm also checking off what I wear, which shows me what I really love and reminds me to wear things I forget about. I do keep track of what I spend and it is a tool that helps me see where I have succeeded and where I might have erred. If garments do not last I think it is money down the drain....happy to see you got an A! I haven't tracked my spending, but know that I should. I bought very little this year in terms of clothing. The items I have purchased have been just so-so for the most part. I've been most pleased with the Gabor flats I purchased. LauraH: What is it with cardigans? It seems that the opening creates more fit challenges, though some women can wear them well. Brora is beautiful quality and I like the subtle colours but if the cut is not for you, that is not sufficient. Mme: I never connected the dots but you have nailed it- accountability. Some time ago I would buy more and let the winners shake out, but I no longer want to live like that. Roberta: Tracking and an inventory go hand in hand, or maybe I should say, in order to reap the full benefit, they should. Did you know there was a book called "Three Black Skirts"? Wardrobe advice aimed at twenty-somethings. hostess: Thank you; now I have to maintain that and not backslide. Sewing: 1999! Perhaps it's time? I wear more Bompard than other brands. If you order the catalog EB send a card of most colours in the season, so you can see if you like the reds. Susan: I think it depends on one's habits. When I did not track what I spent, I spent more and then didn't get good wear from those items. You may be naturally a more prudent shopper. Check the hyperlink on the purple shoes. It points to a wallet on Etsy. Love this post. It gives me a task for 2016. Thank you. For one year I tracked all the expenses that went into my sewing, not garment purchases. It was over a thousand dollars. After that I didn't track any more! Congratulations! I was probably a C- or C this year, and I do track. There were a couple of biggish mistakes that I could have avoided, had I been more determined to do so. I think I will do better this year, although there are still some challenges as I still have some more weight to lose and negotiating the shoals of changing size and shape is tricky at best. At least now I am near the end of purging unused things from my closet. The hardest part was allowing myself to let go of past selves and their accoutrements; the weight of holding onto the past is far more burdensome than any anticipated future cost. I don't think tracking works unless one has a clear idea of who one is and how that is reflected in one's sartorial choices, perhaps a similar idea to Marie Kondo's "spark joy". Now that I am more settled into my retirement self, and know what I actually wear and need, I find myself far less willing to settle for anything that is not quite right. Bunny: The point is not the amount, it's the value that thousand returned. If it's going to sit in an eternal stash, not so great. If it was converted into things you love, yes. You can spend a thousand easily on only so-so clothes, shoes, etc. Duchesse, I'm going to keep track this year and make a report next year. So far, I have bought one item---a scrunch neck t-shirt to replace one I wear all the time which is almost worn out. I would love to buy very little--but make those purchases count. I would love to buy very high quality items that are just perfect for me. Susan: You are 2/3 of the way there, a) a motivating wish to change (in your former comment you said most purchases were "so so") b) a general idea of your goal (better quality items perfect for you) and b)the discipline to track. We can't change what we don't acknowledge. And the (rhetorical, at least here) question is, What is the root cause of your buying the so-so? For me, it was sometimes concern about cost, sometimes haste (need something for that event this weekend!) or I'd get carried away by a sale. Sometimes it was just not finding what I wanted and settling. For other women it is a change in body size or shape, a lifestyle change, or- they never really liked to buy clothes, so ended up with an all-over-the-place wardrobe mainly picked by friends with wildly different tastes. There are probably more reasons, but until they are clear, it is fairly easy to repeat mistakes. Experimentally, for the last 4 years I have entered all of my clothing purchases onto a spread sheet, with the cost of each piece. It is easy to keep track of the monthly and annual totals. I also record the number of times I have worn each piece and have an automatic price-per-wear update. In this way I can assess the value that I am getting from each item and this makes it easier to pass on the under-used pieces as well as to assess where I went wrong with them and hopefully to avoid making the same mistakes in future. I assess not only cpw (I don't record numbers though), but also the intangible joy. It's like my Mac- the joy of use is worth a great deal to me.